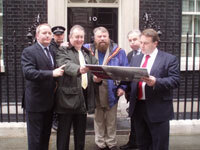 In the fight to rescue Annie the elephant, whose horrendous abuse and suffering was exposed by Animal Defenders International (ADI) over the weekend, and to pursue a ban on the use of wild animals in circuses, ADI representatives, Brian Blessed and politicians representing the main political parties took their ‘Stop Circus Suffering’ campaign directly to 10 Downing Street today. They presented a giant postcard to the Prime Minister, urging him to become involved and help bring about a ban on the use of wild animals in circuses. Jan Creamer, ADI’s Chief Executive said: “To Government we say, the time is now to enact a ban. This campaign is about rescuing Annie, and also the scores of other wild animals currently languishing in UK Circuses. Let’s make Annie’s plight symbolic of a wild animal ban for circuses, let’s ensure she hasn’t suffered in vain." Actor and author Brian Blessed, one of ADI’s most vocal and prominent supporters said: “The abuse suffered by this elephant by those that claim to care for her is outrageous. I am here today to make my feelings known to politicians and whoever else will listen to bring this appalling suffering to an end. We urgently need your help to save Anne, and stop this suffering once and for all. Write to your MP at: The House of Commons, London, SW1A 0AA. Write to Lord Henley, the Minister responsible for animal welfare at: The House of Lords, London, SW1A 0WP. Join our Street Team and raise awareness in your local area. Make a donation and help fund our campaign to end circus suffering. Neil Parish MP, Chairman of the Associate Parliamentary Group on Animal Welfare and Conservative MP for Tiverton and Honiton said: “The shocking footage of Annie the Elephant being repeatedly beaten by her keepers, and the mistreatment of other animals in the care of Bobby Roberts Super Circus, makes it very clear that self regulation of the industry is not an option. “What is more disturbing about this new footage is that it is not an isolated case. Animal Defenders International has already catalogued systemic animal welfare abuses in the circus industry. “The Animal Defenders International investigation has brought to light flawed animal husbandry and the prolonged abuse of wild animals kept by the circus. "Annie is kept in cramped conditions for weeks at a time and is chained to the floor despite suffering from arthritis in her back leg. The plight of Annie the Elephant should serve as a wakeup call to the Government that there is a systemic problem of violence against animals in circuses and that the only way to protect them is an all out ban. Conservative MP for The Wrekin Mark Pritchard, said: “The government need to move quickly to outlaw the ongoing exploitation of wild animals in circuses. There needs to be a complete ban – not self regulation which is proven not to work. The abuse has got to end”. Adrian Sanders of the Liberal Democrats said: “I strongly condemn the disgraceful acts committed by those harming animals, especially those highlighted by ADI of Anne the elephant being abused. I signed EDM 403 without hesitation last year and I will continue to call for an end to the use of wild animals in circuses. Jim Dowd Labour MP for Lewisham West and Penge said: "Some 30 years ago, as a Labour Councillor in Lewisham, I was pleased to vote with the majority of my Council colleagues to deny the use of Council property - Blackheath, to be precise - to circuses using wild animals thus becoming the first local authority in the UK to do so. Despite the vitriolic right-wing attacks that were heaped upon us at the time, it is an idea that has attracted huge support ever since, as demonstrated by the Government’s own most recent public consultaton. "It is now the overwhelming view of the British people that our 21st century society has no place for such barbarism and the Tory/Liberals must act to reflect this immediately or be exposed as supporters of, or at the very least indifferent towards, cruelty to animals." Jan said: “While Annie is the last remaining circus elephant, it is important to bear in mind that as there is currently no wild animal circus ban in the UK there is nothing to prevent other elephants and wild animals being imported, so the cycle of abuse can continue. “Let’s ensure that Annie’s sad tale can never be repeated in the UK and let us all now press ahead for a complete ban. To Mr Roberts we say release Annie now and let her retire properly to a sanctuary and be given space to be free and act like an elephant, as nature intended, for the first time in over 50 years. This activity follows the weekend release of ADI’s shocking footage obtained from behind the scenes at the UK’s Bobby Roberts Super Circus which showed a staggeringly high level of violence and serious animal husbandry flaws. ADI secured footage over a three and a half week period from a camera observing activity in a barn where the animals are kept when not touring, and incidents included Annie (Anne), an elderly, severely arthritic 57 year old elephant being hit with a metal pitchfork and kicked around the face and body 48 times over the period of observation by workers, who are also seen beating and spitting on a camel and beating miniature ponies and horses on numerous occasions. The disturbing footage also shows Annie constantly chained for the entire period of filming by her front and arthritic back leg with only enough room to take one step forward or backwards. Her chains were only changed to different legs twice.